This 3-reel progressive slot incorporates everything you would expect to see in a Vegas-style machine. Apart from having simple rules and classic symbols in play, the game offers a progressive jackpot that is constantly increasing whenever gamblers make a bet on LotsaLoot. 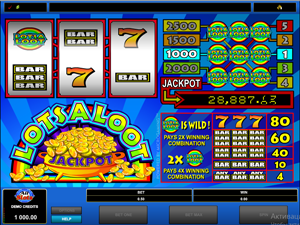 The slot has straightforward visual and sound effects and some of the basic features such as wilds and wild multipliers. LotsaLoot (3-Reel) is a free video slot available without download. 3.9 from 5 based on 16 reviews. The gameplay takes place on a single screen as the paytable is displayed to the right of the reels, as in many other classics. The set of symbols includes single, double and triple bars, sevens, and the slot logo; all as simple as it is. The slot is played over three reels and five paylines with a fixed coin value of $0.5. With each coin wagered, you activate one more payline until you get all the five paylines enabled. Therefore, the max bet permitted on a spin amounts to $2.5. The lowest payout of 4 coins is awarded for a mixed combination of bar symbols. For example, you can roll up one single bar and two triple bars, still being eligible for a 4-coin award. A combo consisting of three matching single, double or triple bars pays out 10 to 60 coins. Another regular icon, the Seven, produce 80 coins, for three of a kind. the LotsaLoot logo pays out on its own. Get three of them on the middle line (Line #1), and grab 1000 coins. Land three of them on Line #2, and be awarded 1500 coins. The same goes for Lines 3 and 4, with a 500-coin increment, until you reach the fifth payline that awards a progressive jackpot. The slot features a progressive jackpot shared with the five-reel LotsaLoot. Whenever players make a bet and spin the reels in whatever LotsaLoot, a small portion of a bet is transferred to the jackpot pool until someone lucky takes it down. 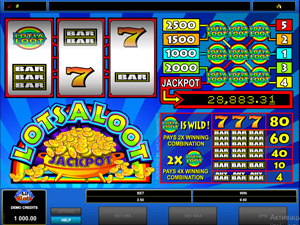 In this slot, a jackpot is awarded when three LotsaLoot logos hit line #5 whilst playing at max. Therefore, to qualify for the progressive, you must bet the top wager of $2.5 taking a spin with all the paylines activated. The current jackpot amount is shown near the reels. The three-reel LotsaLoot progressive slot is a great entertainment for jackpot hunters and classic slot fans. There is nothing in the slot to distract you from the gameplay. Just wager max, put the reels in motion and enjoy the thrills of anticipating a progressive.